Pininfarina launched 4.EVER Pininfarina Cambiano, the everlasting writing pen at Paperworld, the world’s leading fair for stationery and writing instruments held in Frankfurt. The tip in Ethergraph, is made with a special metal alloy, that allows you to write indefinitely with no ink and no refill. The revolutionary writing instrument, born from the collaboration between Pininfarina and Napkin and completely hand made in Italy from master craftsmen, has a precise stroke like a pencil but it cannot be erased like the one traced by a pen. resistant, an eco-friendly material with a minimal environmental impact. The notebook is enriched by the original sketches of the Cambiano concept car. 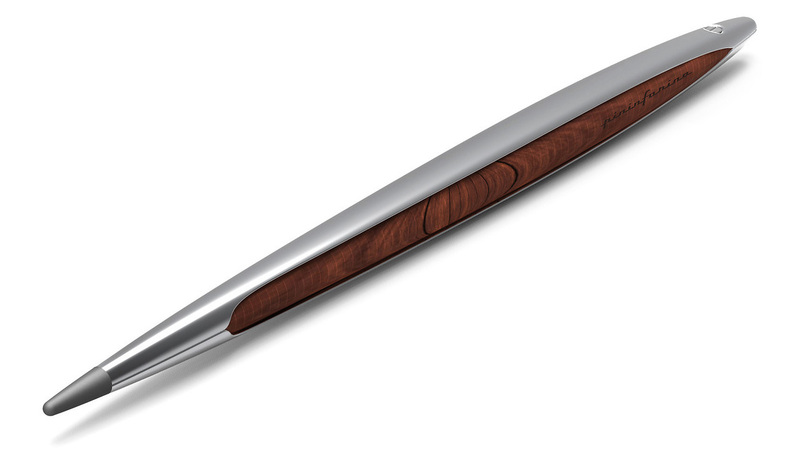 The pen is manufactured using aluminium and wood following the lines of the design of the Cambiano concept car. Amazing isnt it, a real luxury in your hands! This entry was posted in Luxury and tagged Cambiano, Paperworld, pen, Pininfarina, writing instruments. Bookmark the permalink.